The University of Southern California School of Pharmacy Comprehensive Medication Management (CMM)-based APP certification program prepares pharmacists to optimize treatment plans for complex patients with poor or fragile health who are at high-risk for medication-related problems. 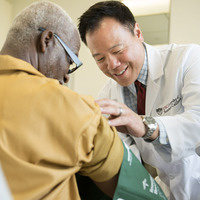 In addition to being fully compliant with California Board of Pharmacy-approved criteria for APP certification, the USC School of Pharmacy program is distinct in that APP is taught within the standards of Comprehensive Medication Management, which has been recognized by the state of California and nationally by CMS as a “breakthrough innovation” for significantly improving patient experience, health outcomes, and cost savings. As efforts to spread awareness and adoption of sustainable CMM services locally and nationally progress, you can be at the forefront by attending this program. Credit: Earn 28 hours of continuing education credit, including 20 hours of web-based self-study and 8 hours of live classroom study. Fulfills the certification requirement for advanced practice pharmacist licensure – Assures that participants are able to perform patient assessment; order and interpret drug therapy-related tests; refer patients to other healthcare providers; participate in the evaluation and management of disease and health conditions in collaboration with other healthcare providers; initiate, adjust and discontinue drug therapy. 20 hours web-based self-study modules including current practice guidelines/evidence, instructional videos taught by experienced faculty and clinicians, and useful tools and resources. Training is based on over 30 years of CMM practice experience in multiple healthcare settings serving commercially insured, senior, underserved / safety net, and Veteran populations and health systems. 8 hours live training on November 3, 2018, at USC School of Pharmacy with a heavy emphasis on application, patient evaluation/interaction, and final competency assessment. Participants successfully completing the program will receive a USC School of Pharmacy CMM certificate that can be used to document advanced practice training.